One of the coolest, most platform-appropriate mini-DAWs on the App Store - a focused, fun and frequently inspirational mobile musical notepad. Fiddly on the iPad mini. iTunes-only file sharing. Egoist comprises three main, independently sequenced modules: Bass/Beat, Slicer and Effects. Beat/Bass plays host to a sample-based drum machine and a one-oscillator bass synth. You get 15 drum kits (each accessing 96 samples), covering a vast expanse of sonic ground, while the synth offers saw and square waves and three filter types. "The slices can be triggered via MIDI, the built-in keyboard or the 16-step sequencer"
Apart from pitch control, the drums can't be edited at all (and you can't import your own samples), and the synth is decidedly basic; but both sound great and are nothing if not intuitive. 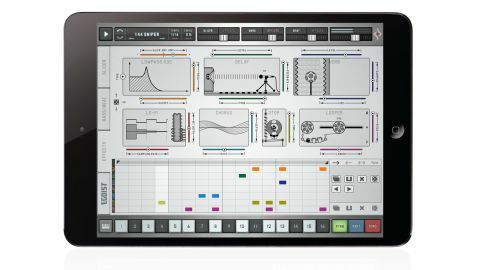 The Slicer module chops samples (from the impressive bundled collection, your iPad Music library, or imported via iTunes) into up to 16 slices, at their transients or manually. The slices can be triggered via MIDI, the built-in keyboard or the 16-step sequencer (set the slider on each step to the desired slice number), which features modulation lanes for controlling level, pitch, forward/reverse playback, attack and decay. The Effects page houses seven characterful FX modules (Reverb, Chorus, Comb, Delay, etc) and an Effectrix-style sequencer, for rhythmic processing of the three sources, collectively. Egoist's Pattern/Part/Song-based approach to track construction is resolutely old-school but effective enough when you want to string a few parts together. AudioBus, Inter-App Audio and AudioCopy/Paste are all supported, projects can be bounced (unlike the desktop version! ), and there are randomise buttons all over the shop, for instantly conjuring chaotic patterns and effects setups. Some of the finer controls can be a bit fiddly to get a virtual grip on (particularly on an iPad mini), and exporting project files to the Windows and OS X versions can only be done via iTunes file sharing, but those are just about the only gripes we have.